Each year, The Marine Mammal Center takes part in Coastal Cleanup Day, an event organized by the Ocean Conservancy. It's all part of the greater International Coastal Cleanup Day, which mobilizes volunteers from all over the world to care for our beaches and waterways. As part of Coastal Cleanup Day, The Marine Mammal Center leads a group of volunteers to clean up Rodeo Beach, just down the hill from our hospital. The cleanup efforts yield a variety of trash that can pose a danger to wildlife and the environment. Rusty metal, wood with nails, hundreds of plastic bags, more than one thousand food wrappers, and more than one thousand and cigarette butts. Other items found include evidence of a dog friendly beach, such as tennis balls and bags of dog poop. Shotgun shells are also among the hundreds of pounds of trash that have been picked up on the beach. International Coastal Cleanup Day is the largest volunteer event in the world, bringing together more than 600,000 people to cleanup beaches and coastal waterways. Results for the 2013 International Coastal Cleanup Day were impressive. According to the Ocean Conservancy, a total of 561,633 people picked up 10,149,988 pounds of trash along 17,719 miles of coastline in 97 countries around the world. Their 2013 Report is loaded with data detailing everything from the top participating countries, the most common items found, to the total number of volunteers in each country. California Coastal Cleanup Day is part of the international effort and is supported by the California Coastal Commission. During the 2012 cleanup, more than 65,000 volunteers came together to cleanup beaches, lakes, and waterways around California. They picked up almost 770,000 pounds of trash and recyclables. The 2013 Coastal Cleanup Day coincided with a torrential downpour along the Northern California coast, which really showed how strong the dedication of volunteers is to cleaning up our coast. People came out in the rain and braved the cold winds to show their love for our coastal areas. Turnout was somewhat less than in previous year, but nevertheless, 51,543 volunteers came out to pick up 471,218 pounds of trash and 30,530 pounds of recyclable materials. In some years, the Center has been able to release California sea lions at Rodeo Beach as part of the day's activities. This is a great way for volunteers to see how important their work is. 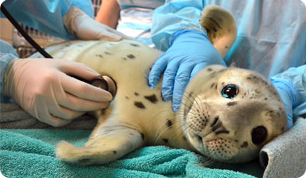 Patients that have been treated at The Marine Mammal Center need a clean and healthy ocean when they return home. It is truly a gratifying experience to watch healthy sea lions running toward the surf as they return to their ocean home!